If you've paid any attention to news coverage of the Catholic Church at any point in the last 15 to 20 years, chances are you've seen or heard from John L. Allen Jr. Now on staff at The Boston Globe and a key contributor to their Catholic news website Crux, Allen has been covering the Vatican since he first headed to Rome in 1998. At the time, it was a backwater to most news outlets and almost no American media had a presence on the ground. So Allen had this beat almost to himself as far as US audiences were concerned. Allen has also written a string of increasingly confident books, including not one but two biographies of the man who would become Pope Benedict as well as a demystifying look at Opus Dei. 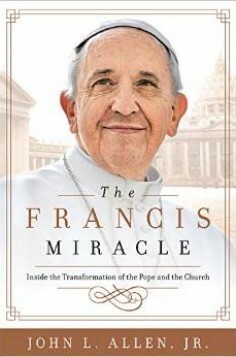 Now with his latest work The Francis Miracle, Allen turns his eye on the pope with popularity ratings a movie star would envy as well as a Reagan-like ability to overcome any momentary stumbles in his off-the-cuff remarks simply because people like him. As Allen has put it, with Pope Benedict everyone felt the things they disliked about the Catholic Church were because of him. With Pope Francis, they feel the things they dislike about the Catholic Church are despite him. Allen's new book contains a biographical sketch of Francis and his life, mostly with an eye towards how those experiences might color the Pope's worldview and the priorities he has for the Church. Then Allen looks at key issues facing the Church such as much-needed financial reform, the role of women, the child molestation scandals and the lack of accountability for those who covered it up for decades. It's a snapshot of the Francis papacy, where it's at today, how he is doing and what to look for in the future. I talked with Allen in-depth, discussing his unlikely career path, the many controversial issues facing the Catholic Church, the personality of Francis versus Benedict and why non-Catholics need to be aware of the Pope and his priorities just as they would with any other major world leader. You can see the entire interview at BookFilter.com. Following are some key excerpts. Allen talks about Pope Francis, how he broke new ground by working with and for women as a young man and why women are so far disappointed with his track record. Allen talks about his unlikely career path that veered from religious studies to being the faculty adviser for a high school newspaper to hot rods and then -- suddenly -- the Vatican. You can follow John L. Allen Jr. on Facebook and Twitter or at Crux and the Boston Globe. To see the full interview, head to BookFilter.com and watch the video embedded on the front page. Thanks for reading. Michael Giltz is the founder and CEO of BookFilter, a book lover's best friend. It's a website that lets you browse for books online the way you do in a physical bookstore, provides comprehensive info on new releases every week in every category and offers passionate personal recommendations every step of the way. It's like a fall book preview or holiday gift guide -- but every week in every category. He's also the co-host of Showbiz Sandbox, a weekly pop-culture podcast that reveals the industry take on entertainment news of the day and features top journalists and opinion makers as guests. It's available for free on iTunes. Visit Michael Giltz at his website and his daily blog.